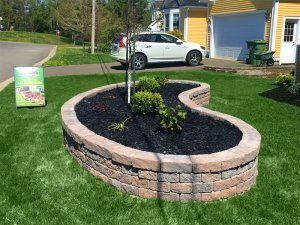 We offer start to finish landscape installation and construction services for your newly built home or commercial building. Our team has the knowledge, equipment, and experience to bring your vision to life. We work with you every step of the way to create a landscape that you can be proud of. Concrete unit pavers (commonly referred to as interlocking brick) are a very popular and extremely high quality product. Unlike asphalt, interlocking pavers will not crack due to winter frost activity. Interlocking brick also adds greater value and more aesthetic beauty than asphalt or concrete. The initial cost of this method is higher than asphalt or concrete, however the substantially increased lifespan of this product actually makes interlocking pavers a very cost effective and more sustainable option. 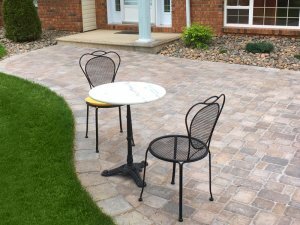 Some types of concrete unit pavers can last for several decades. Our skilled team of certified installers carefully handles every aspect of the job. From the initial excavation to the final steps of the installation phase, we ensure every step of the project is done properly. Our staff are trained and experienced in the use and installation of ALL types of interlocking products. In addition to walkways and driveways, we also offer construction and installation of interlocking patios, steps, and fire pits. A number of landscapes require some type of retaining wall. Our walls are designed and created to add both functionality and aesthetic beauty to your landscape. We will work with you to select a product that is capable of performing the required task, and that also suits your needs and taste. Before the construction phase begins we consider important factors such as slope, drainage, excavation depth, and potential frost movement in order to insure that your retaining wall is properly designed and constructed. We also construct decorative garden walls to help accentuate the appearance of your planting beds. Planting has many positive benefits. Trees, plants, and shrubs can be very beautiful, and they also help to filter contaminants, improve air quality, and increase environmental sustainability. We offer our customers a vast selection of different styles, shapes, sizes, and colours of shrubbery and plant life. We will work with you to create beautiful beds that you are proud to show off to your friends and neighbours. 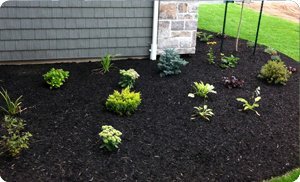 When selecting plant life for your property we consider factors such as sunlight, shade, soil conditions, and beauty to ensure that we create beautiful and sustainable beds for our customers. Before installing a lawn, there are many important factors which must be taken into account. We will assess your property and consider factors such as the existing sub-grade, the natural slope and drainage of the property, surrounding conditions, machine accessibility, desired topsoil thickness, and customer preference and budget. 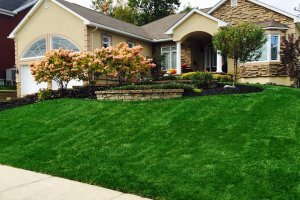 We offer our customers two primary lawn installation options: sod installation and hydro seeding. Sod tends to be more expensive, however it adds instant beauty to the landscape. Sod is less prone to weed growth in the early stages. Hydro seeding can also produce beautiful lawns, however it usually takes a few weeks until a hydro seeded lawn is fully established. The hydro seed mixture itself can be potentially susceptible to washout during rainfall when it is sprayed in sloped areas. We can also repair or replace an existing problematic area of an already established lawn. 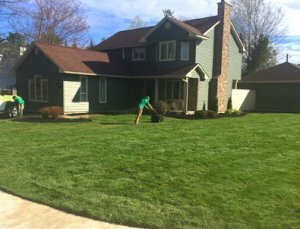 We will be happy to assess your lawn and decide the best course of action in order to help you achieve the lawn of your dreams. In some cases heavy equipment is required in order to get the job done. We have top quality machinery, and highly skilled operators who can get the work done properly and efficiently. 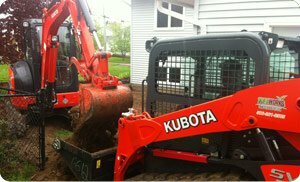 If you require a backhoe, mini excavator, full size excavator, or tandem truck we have the equipment and the experience to handle almost any project. Clark and his staff are awesome! We have had some horrible experiences with contractors in the past. Turf Works was fantastic to deal with. The staff were hard working, professional, and polite. Our beds look great, and we were very pleased with the entire customer experience.